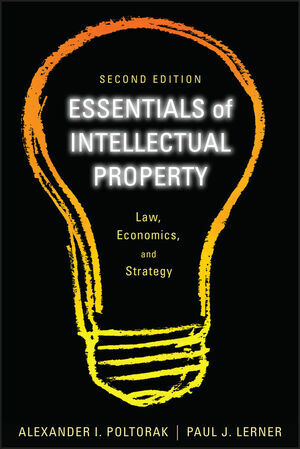 Full of valuable tips, techniques, illustrative real-world examples, exhibits, and best practices, the Second Edition of this handy and concise paperback will help you stay up to date on the newest thinking, strategies, developments, and case law in intellectual property. Providing business professionals and IP owners with in-depth knowledge of this extremely important subject, this book helps those new to this field gain a better understanding and appreciation for the results of their creative abilities. ALEXANDER I. POLTORAK is the founder, Chairman, and CEO of General Patent Corporation (GPC), an intellectual property (IP) firm focusing on intellectual property strategy and valuation, IP licensing, and enforcement. PAUL J. LERNER is the Senior Vice President and General Counsel of General Patent Corporation (GPC). He coauthored Essentials of Licensing Intellectual Property, as well as articles in Intellectual Property Worldwide, Patent Strategy & Management, and Managing Intellectual Property. 1 The Big Three: Patents, Trademarks, and Copyrights. 2 The Supporting Players: Other Types of IP Trade Secrets and Know-How, Mask Works, and Non-Competition and Non-Disclosure Agreements. 3 Protecting the Fruits of Your Research and Development. 4 Know What You Have (IP Audit) and What the Other Guy Has (Competitive Intelligence). 5 What Is It Worth? Putting a Value on Intellectual Property. 6 Make More Money by Sharing (Licensing). 7 Corporate Officers and Directors Beware -- You Can Be Liable for Mismanaging Intellectual Property. 9 The Fundamental Things Apply, As Time Goes By -- Intellectual Property in Cyberspace. 10 The Patent Portfolio and Its Effect on Stock Price. 11 How the Courts Have Changed the Patent Law. Appendix A: Trademark and Service Mark Application. Appendix C: Confidentiality and Nondisclosure Agreement. Appendix D: Invention Assignment Form. Appendix E: Basic IP Audit Questionnaire. Appendix G: Invention Disclosure Form.